If North Korea is denuclearizing, why is it expanding a nuclear research center? 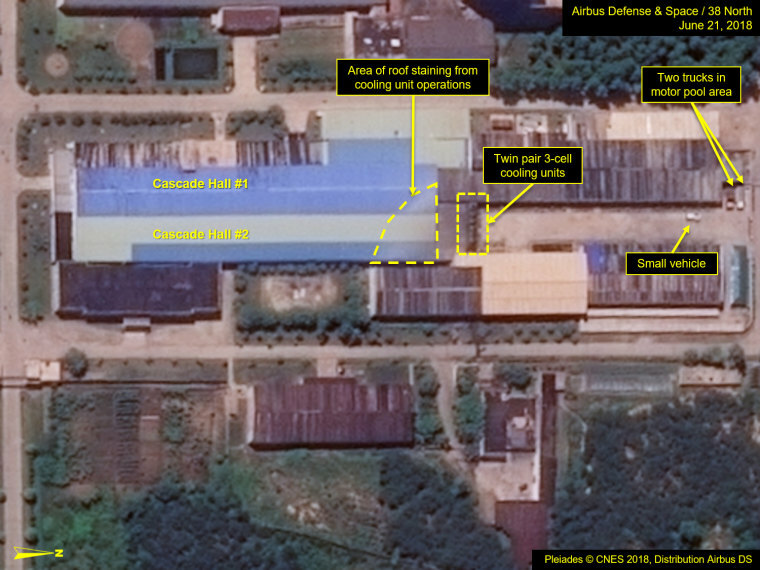 Satellite photos show work continuing at a North Korean nuclear research center, and experts disagree on whether it means the regime is not denuclearizing. WASHINGTON — North Korea continues to make improvements to a major nuclear facility, raising questions about President Donald Trump's claim that Kim Jong Un has agreed to disarm, independent experts tell NBC News. "North Korea is continuing to expand its facilities to produce nuclear weapons and ballistic missiles," said Jeffrey Lewis, director of the East Asia Nonproliferation Program at the Middlebury Institute of International Studies at Monterey. "We have never had a deal. The North Koreans never offered to give up their nuclear weapons. Never. Not once." James Acton, co-director of the Nuclear Policy Program at the Carnegie Endowment for International Peace, added, "If they were serious about unilaterally disarming, of course they would have stopped work at Yongbyon. There is a huge gulf between what the administration apparently thinks North Korea is going to do and what they intend to do, and that's exceptionally dangerous." He added, "The Trump administration is lying to itself and to the American people." A spokesman for the White House National Security Council did not respond to a request for comment. Spokesmen for the Director of National Intelligence and the CIA declined to comment. Allison Puccioni, an imagery analyst at Stanford's Center for International Security and Cooperation and an expert on the Yongbyon facility, said it was unrealistic at this point to expect North Korea to have stopped working on the reactor complex. "Just because they blew up one or two tunnels at a nuclear test site doesn't mean they are going to stop working on a reactor that they are telling everybody that they are using for electricity," she said. Joel Wit, a senior fellow at the Stimson Center and the founder of 38north, agreed. "What you have is a commitment to denuclearize — we don't have the deal yet, we just have a general commitment. So I don't find it surprising at all" that work at Yongbyon continues. But Wit added that he thought Trump had "oversold" the idea that North Korea would soon denuclearize. The gulf between rhetoric and reality is "exceptionally dangerous," Acton said, because "sooner or later…I think Trump is going to feel he has egg on his face. I worry deeply he'll start lashing out like he did last summer." After their Singapore summit, Trump and Kim issued a joint statement agreeing to "work toward complete denuclearization of the Korean Peninsula." The document, less than 400 words, offered almost no details about how or when that would happen. Asked a few days later whether North Korea's denuclearization would be "verifiable and irreversible" — given that those words are not in the declaration, Secretary of State Mike Pompeo responded that he found the question "insulting and ridiculous and, frankly, ludicrous. I just have to be honest with you. It's a game and one ought not play games with serious matters like this." He added, "The modalities are beginning to develop. There'll be a great deal of work to do. It's — there's a long way to go, there's much to think about, but don't say silly things." At a June 20 rally in Duluth, Minnesota, Trump defended his decision to meet with Kim, bragging that he extracted a major concession from the dictator: "Sentence one says 'a total denuclearization of North Korea,'" Trump said. "There will be denuclearization. So that's the real story." It's not clear from the satellite imagery to what extent the Yongbyon reactor is operating, the 38north report said, but it concluded that uranium enrichment appears to be in progress. Wit, who negotiated a 1994 deal with North Korea, said the facility has become less important to North Korea's program, and currently produces enough nuclear material to build two to three bombs every two years. In 2007, North Korea agreed to shut down the site, and in 2008 the regime blew up the main cooling tower. But after talks collapsed, North Korea in 2009 resumed the reprocessing of spent fuel to recover plutonium at the site. In May, weeks before Trump met Kim in Singapore, North Korea appeared to destroy three nuclear tunnels, observation buildings, a metal foundry and living quarters at its Punggye-ri nuclear test. But experts said the site could easily be rebuilt.